Σχεδιασμένο για ταξίδια τόσο επαγγελματικά όσο και διασκέδασης, το Green World Hotel-Grand Nanjing είναι ιδανικά τοποθετημένο στη Ζόνγκσαν, μια από τις διασημότερες περιοχές της πόλης. Το ξενοδοχείο δεν απέχει πολύ από το κέντρο της πόλης: μόλις 4.0 KM, και συνήθως χρειάζεται περίπου 35 λεπτά για να φτάσετε στο αεροδρόμιο. Με την βολική του τοποθεσία, το ξενοδοχείο προσφέρει εύκολη πρόσβαση στους προορισμούς της πόλης που πρέπει οπωσδήποτε να δείτε. Με τις υψηλού επιπέδου υπηρεσίες και την μεγάλη ποικιλία ανέσεων, το Green World Hotel-Grand Nanjing δεσμεύεται ότι η διαμονή σας θα είναι όσο πιο άνετη γίνεται. Το ξενοδοχείο σας παρέχει δωρεάν WiFi σε όλα τα δωμάτια, ημερήσιος καθαρισμός, παράδοση ειδών παντοπωλείου, αυτόματο πλυντήριο, υπηρεσία ταξί. για να εξασφαλίσει ότι οι πελάτες μας θα απολαύσουν την μεγαλύτερη δυνατή άνεση. Ελάτε σε ένα από τα 128 φιλόξενα δωμάτια και ξεφύγετε από τα άγχη της ημέρας με μια ευρεία γκάμα ανέσεων, όπως επίπεδη τηλεόραση, επιπλέον μπάνιο, επιπλέον τουαλέτα, τηλέφωνο μπάνιου, μοκέτα, που θα βρείτε σε ορισμένα από αυτά. Εξάλλου, το ξενοδοχείο διοργανώνει πολλά ψυχαγωγικά δρώμενα έτσι ώστε να έχετε πολλά πράγματα να κάνετε κατά τη διαμονή σας. Έξοχες υπηρεσίες και μια εξαιρετική τοποθεσία κάνουν το Green World Hotel-Grand Nanjing την ιδανική βάση από όπου θα απολαύσετε την παραμονή σας στη Ταϊπέι. Guests checking in before 03:00 PM will be charged an additional fee of NTD 300 per hour. Guests checking out after 12:00 PM will be charged an additional fee of NTD 300 per hour. the location is in the heart of taipei city and it is easy to take MRT or bus to everywhere. The breakfast is great for Asian, there are also a lot of cafe around there. I keep coming back to this hotel for the great value it offers. The rooms are excellent for this price segment, better than some pricier hotels. It is located in the centre of Taipei, a short walk to Songjiang Nanjin MRT station. It can be a bit quiet at night as this is some sort of a business district, but there is a 7-11 just across the road. The staff are extremely helpful and polite. Definitely one of the great hotel and very convenient location, except that the bed is quite hard. Location is superb, we took MRT to most of the places and 2 stops away from HSR. Overall, would like to come back to this hotel again next time! I had two good nights there. It is very close to SONGJIANG NANJING STATION （捷運松江南京站） and NANJING JIANGUO （南京建國路口巴士站）bus stop. I could even see Taipei 101 from my window!!! The cleaning service passes my standard, but there was some dirt in the corner. Generally a nice choice. Nice big rooms, one of the bigger ones I have stayed in Taipei. Good room facilities, nice breakfast, friendly staff as expected for Taiwan. Brief walk to nearest train station, about 5 mins. Plenty of restaurants and food choices nearby. 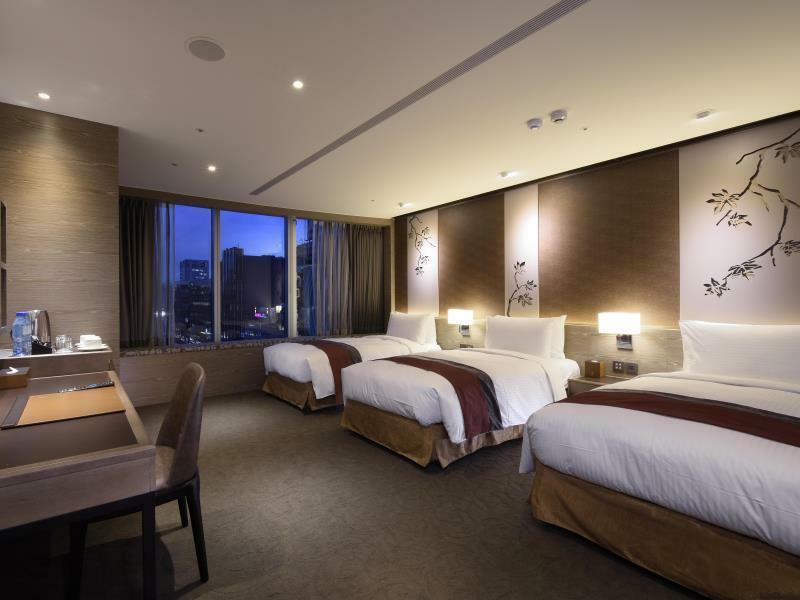 Booked an overnight stay at Green World Grand Nanjing. Beds were firm and comfortable and liked that their pillows were not flat like most hotel pillows. Room smelled like there were 10 smokers in their previously but I think it is their air filter because the same smell was in the hallways as well. Very clean room and enjoyed the breakfast buffet. Deluxe King Bed Review We are a family of three, staying for 4 nights in May. In summary, it has been one of the best stays we ever had anywhere. Location: it is located in between two subway stops: Songjiang Nanjing and Nanjing Fuxing. Nanjing Fuxing is a transfer station so it is very convenient. I heard from other reviews saying that it is quite a walk, but for us it is great. We are used to long walks anyway and we could easily find buses there, too. We are fast walkers so it takes just about 5 minutes so location didnt bother us. Plus there are lots of convenient stores nearby and small eateries in the alleys. There're also some Japanese fast food restaurants. Service: our check in was fast and efficient. Many of the staff speak decent English so we had no problem communicating. We had free breakfast and it was great: we ate there 4 times and except for the scrambled eggs, beverages and cereal corner, all of the menus were different day by day. Note: there were 8 different main food to choose from. Dimsum and bao were also available. Room: We requested a room on the high floor and in the corner because we have a toddler and these requests were given so we were happy. We had windows on two sides of the room and we could even see the Taipei 101 from the distance. The city view was great, overlooking the main street and not back alley. We had a king size bed so it was huge. The bathroom was wide, a bathtub and a shower. Rooms have all amenities: closet, slippers, mini bar, deposit box, water kettle, hair dryer, and they replenished the mineral water everyday. Even if you didnt finish them, they would give two more for free. We never ran out of water when we stayed. The room was wide and our toddler loved it. Overall a very nice hotel, we would recommend this hotel to anyone and we would love to stay here again. Hotel looks new and room I had was spacious. Bathtub in toilet equipped with small tv screen. Though mine is not working too well, staffs tried their best to resolve but couldn't as it was a technical issue and the technician wasn't in for the day. Staff apologized sincerely and it wasn't a big deal for me as it's only a short stay for me. Room was clean and neatly tidied up. Location is in between 2 stations therefore short walk but peaceful environment. Would definitely go back if I'm there again. I cannot complain anything about the hotel except the breakfast restaurant/service. They let the hotel guests wait in total darkness (the lights were off) who are waiting for the 7AM opening of the restaurant. We have to return the plates, cups, glasses after eating. By doing so, no one is cleaning the table. They should at least one more staff to do the cleaning and clearing of the tables. I saw them preparing the fruit juices by diluting syrup liquid in water. Also, the bread toaster is too small for the number of guests. Room is very well furnished and hotel is located near MRT station. Service by front office is very good but breakfast is below par. Many eateries surround the hotel so food is not an issue. Elixir hotpot (Wu Lao Guo) is within walking distance, a great option for dinner. Will definitely stay here again in future. Stayed at superior double room for 3 night. The facilities are new and clean. Staffs were kind and helpful. I have seen that the bed size for this room is double size, but actually it must be more than king size bed! So big! Clean bath room with big bath and bathroom TV. Used it every night. Slept so well after bath. Nice location as well. Breakfast is quite simple. Not so many dishes. But it is Taipei, the city has lots of many attractive breakfast. No prob at all. Great location, few steps away to the train station, very convenient. There’s convenience stores and many food places nearby. Hotel is clean and has a really nice smell once you step in. The staffs are polite and helpful. The room is spacious and very clean too. Only downside is there isn’t a gym or pool around. Other than that, my parents and I are very satisfied with the place. Lovely spacious hotel, clean and great location. Horrible breakfast, I just ate bread every day for 6 days. If this hotel had a decent breakfast for the price, it would be a popular choice for foreigners! 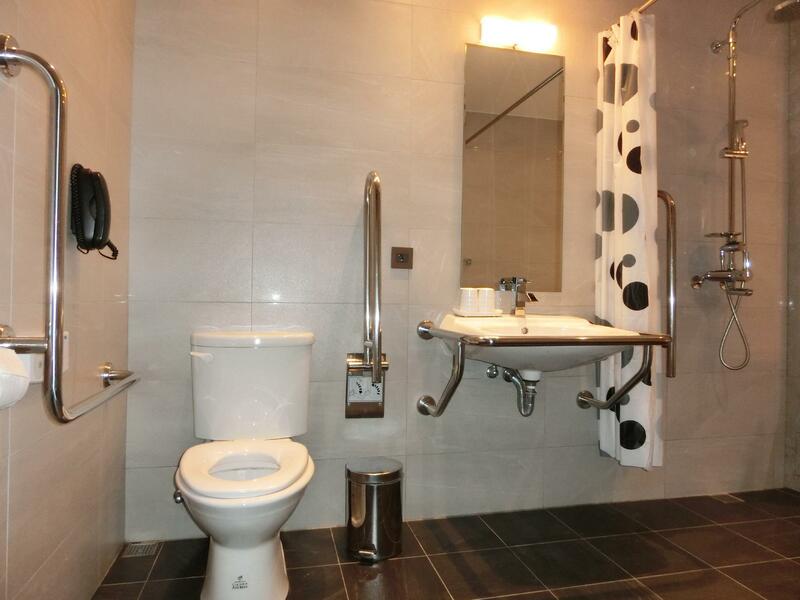 This is a newer hotel and the bathroom is very clean and spacious. We stayed in a superior double room on the 9th floor for 4 nights. The breakfast has enough varieties and is pretty good and tasty for the price included in the booking. They hold strict rules about early check in and late check out. The room has no drawers for clothes, a minor drawback. Although our room is facing the street, it is quite and doesn’t have much street noise. Overall, it is a very good and clean hotel for the price we paid. The staffs are very friendly and helpful.. I have booked 2 rooms. At first they actually arranged 2 different level for us but make the effort to change for us as we have kids and elderly and will require to be in the same level. The bathroom was fabulous.. I enjoyed the bathtub so much.. Overall, I will definitely booked the hotel again..
Σταθμός Μετρό Songjiang Nanjing στα 0.43 χλμ.